Located at the base of the historic Ventura Pier, this seafood restaurant offers spectacular views of the pier and the Channel Islands. 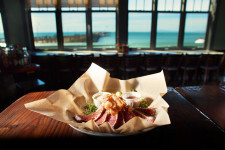 The casual, eclectic, fish market menu has something mouthwatering for everyone. From the spicy grilled Stuffed Pasilla Chile and fresh charbroiled fish to the decadent desserts and Specialty Cocktails. “Seafood Prepared to Its Best” since 1981!